The sultry Italian beauty swept onto the Hollywood scene, and into many Hollywood scenes, at a time when curvaceous platinum blondes were the order of the day. She staunchly resisted the efforts of those who tried to persuade her that a slight tweak of some of her strongest facial features in order to conform to current ideals was a good idea! Can you imagine Sophia Loren with a short, tip tilted nose!! The much-lauded first lady of Italian film, with her characteristic cats eye makeup, who once famously announced that “Everything you see I owe to spaghetti” has spent most of her life living in her home country Italy and latterly Geneva. This has allowed her to take full advantage of the Mediterranean way of eating that, apart from spaghetti, includes a lot of olive oil. It also incorporates plenty of healthy whole grains, seafood, fruits, vegetables and legumes. But back to the olive oil…. Sophia has long consumed around 2 teaspoons of this (extra virgin of course) in her daily diet. However, when she admitted that her soft, glowing skin was not the result of expensive potions and lotions but of topically applied olive oil, she shocked more than a few beauty experts. She is also reputed to use it as a bath oil. Whilst it may sound like a strange use for this culinary staple more commonly found in the kitchen than the bathroom, olive oil is in fact a great moisturizer and skin conditioner. It’s also rich in vitamin E, an antioxidant. When it comes to makeup, Sophia has always gone for artfully placed rather than overdone. Her signature cat eye makeup is famous and she still uses this technique today to accentuate her lovely almond shaped eyes. Sophia is also renowned for her figure, which she still has today at 82 years of age. She’s kept it that way by judicious portion control and of course her healthy Mediterranean style diet. She also enjoys walking and swimming, which both help her keep fit and healthy. Those fine lines around your mouth, nose and forehead, the crows feet that radiate out from the corners of your eyes, the wrinkles that crease your forehead, the sagging skin on your neck…. All those are devastatingly telltale signs that your skin has started to lose the suppleness and elasticity of youth. Did we mention how fast Skinception® works? Incredibly, within seconds of application you’ll notice a visible reduction in those demoralizing lines and wrinkles! And you’ll feel invincible, ready to take on the world knowing you look great. That’s the Skinception® Instant Wrinkle Reducer effect. 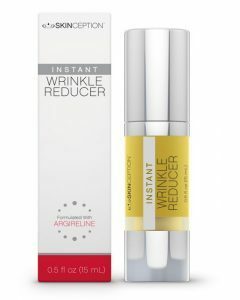 The Best Wrinkle Cream On The Market! Lines Under Eyes? No More! In fact, there’s nothing quite like the confidence and self-assurance of youth and the upbeat, positive demeanor that goes with it. Watch as those around you are positively affected by the new sparkle to your step, the determined glint in your eye and the way you exude confidence and vitality. What a great feeling – to be the envy of others thanks to your glowing, radiant, youthful appearance. That’s definitely the Skinception® Instant Wrinkle Reducer difference – currently the best wrinkle cream on the market! It’s About Aging Gracefully Or Is It! As you get older, you come to accept where you’re at in life. If you’re a Baby Boomer or early Gen X person, you’re generally comfortable with yourself. You’ve come to terms with life, you’ve established your identity, you’re savvy about most things and, overall, you’re generally satisfied. Family, career, security and so on. But you may not be quite as happy about how age, and those life experiences which ironically have made you the person you are today, show up on your complexion. Powerful Skinception® Instant Wrinkle Reducer helps realign your inner self with your outer self. So, you can step out in life with the confidence and assurance that comes with knowing that not only do you feel young, happy, full of life and vigor on the inside, you also look it on the outside too. You’ve also reached the stage in life where you enjoy the finer things but you’re also an astute consumer. You know you don’t necessarily have to spend a fortune to get the best and that often it’s the science and effectiveness of what you buy that’s more important. You’ve also seen enough of the damage they cause to know that you want to avoid harmful chemicals wherever possible. Especially when it comes to what you put on your skin. That’s where powerful Skinception® Instant Wrinkle Reducer comes in. It produces identical results to Botox® without the risk of putting a toxin into your body. Michelle Williams – Aging Gracefully Is Easy With Perfect Skin! Next post Cate Blanchett Skin Care – Aging with grace or the best wrinkle cream?